The new data exploration features consist of a new quick menu, mouse-over popups, and click-throughs. Here are some examples of each of these. There's now a drop-down menu on the top right corner of some of the screens in your dashboard. It’s called it quick menu and it allows you to switch between different reports within a specific screen in your dashboard. It’s multifunctional so that in addition to selecting a specific report, you can specify additional parameters such as how the data is grouped. Here's how the quick menu looks like in the Completed Tasks screen when the underlying tool is Jira. It is split in two sections so that the top section contains different sub reports and below that are the grouping options, which allows you to change how the data is grouped. For example, if you want to see the number of issues completed per Epic instead of issue type, you can change it from the menu. The chart will update it's contents immediately. Previously this was possible only via changing the chart settings. But you may not want to change the settings just in order to see what your data looks like. That's the idea of data exploration - being able to freely explore your data without having to configure or change settings! Our stacked area charts have been updated to have a hover over function helping you to see the exact numbers for a specific date. When you move your mouse pointer over a chart, a pop-up window appears to show the totals for the date range. 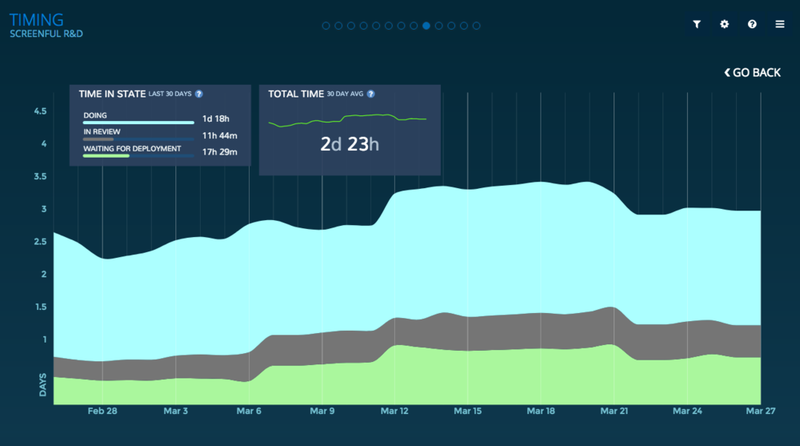 Previously mouse over effect was available only in the bar charts and but now you can see them in all screens that have stacked area charts: Open Tasks, Completed Tasks, and the Timing screen. We've added many click-throughs to our charts so that you can drill in your data just by clicking on what your see in the screen. This can be a headline of the chart or some part of the chart itself. The clickable areas have hover effect providing a hint that it’s clickable. Clicking it, shows either another chart, or a list of tasks behind a specific number. For example, in the Completed Tasks chart, you can click-trough from the numbers in the overlays to see a list of individual tasks. Also when you hover mouse over the chart, you can click on any individual day to see the completed tasks for that date range. Weekly/Monthly/Quarterly breakdowns are now also clickable so you can click the bars to see the list of tasks behind the numbers. The Timing screen has several clickable elements. They are highlighted in the screenshot below. 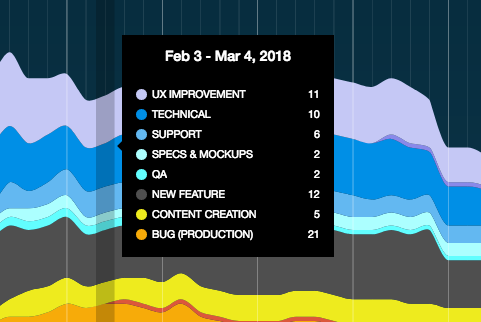 For example, if you click-through from the Cycle time headline, you'll get a stacked area chart showing the timings of each of your In progress workflow states. We hope that these new data exploration features not only help you to find the information that you're looking for but also to discover new insights that you may not have thought of. Go ahead and start exploring!